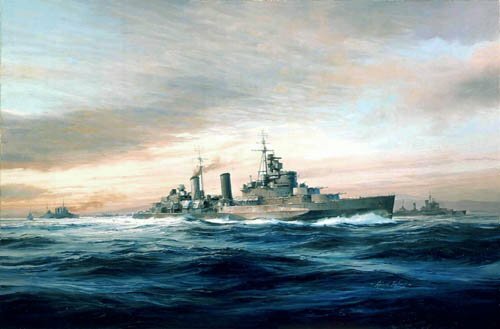 At the outbreak of World War II, H.M.S. Belfast had already joined the Home Fleet operating out of Scapa Flow. Patrolling north of the Faeroes in October 1939 she came across and captured the German liner Cap Norte. This success was short-lived, however, when she struck a mine, the explosion breaking her back. After repairs and modernisation she was the best-equipped cruiser afloat. Later she went on to play an important role in the Normandy Landings of June 1944.